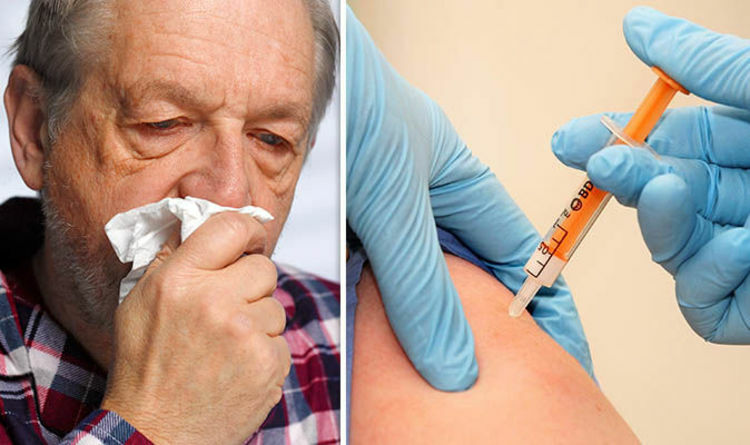 Flu jab 2018: Can you have the flu jab if you have a cold? The NHS has advised delaying your flu vaccination if you are ill with a fever, until you have fully recovered. However if you have a minor illness with no fever it should be safe to have a flu jab. Anything more serious than a cold and you should hold off until you are better. This is because getting the flu jab while you have a fever could prolong your recovery and your body may not respond as well as it should to the flu vaccine. When you get the flu jab, it triggers an immune response in your body. As this happens, your immune system develops antibodies against the influenza virus which is in the vaccine so that it will recognise it and and be able to fight it off if you are exposed to it again. However if you are sick when you are vaccinated, your body is working hard to fight the germs which caused the illness in the first place. This in turn means it will be more difficult for your body to develop antibodies to the influenza at the same time. You may take longer to recover from your illness as your immune system tries twice as hard to fight the two viruses. Your body may also not response to the flu has as it should when you are sick, as your body may not develop enough antibodies to the strains of influenza in the vaccines as it would when you are well. This might not happen when you get the flu vaccine and have a fever, but these are possibilities. However when you have just a mild illness, such as a cold, there is no reason to wait to get vaccinated. A cough, congestion, headache, and sore throat are common cold symptoms, but will not prevent you from getting a flu jab and will not affect your body’s response to the vaccine. If you have a temperature of 99 or 100F and no serious systems, there is no reason to hold off on getting your flu jab. Who shouldn’t have the flu vaccine? However, in recent years, flu vaccines are egg-free have become available. If an egg-free flu vaccine isn’t available, if an egg-free flu vaccine isn’t available, your GP may be able to find a suitable flu vaccine with a low egg content.